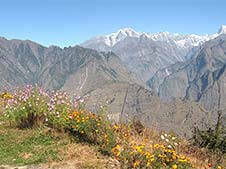 Uttarakhand is rich in glimpes from nature and the biodiversity that is not observed frequently. Snow trekking is the best option to be done in vacation,where you opt trekking in Uttarakhand there are fewer trek to stand parallel to Auli Gorson winter trek. And winter snow trekking can be with bundles of fun,when it has charming green meadows and whispering beauty covered in white snow. Other than winter Auli Gorson Bugyal is fully loaded with colours, and winter trekking inspires the most tentative in cool adventure. When we step toward the route Auli Gorson of Garhwal Himalayas from Rishikesh to Joshimath the thirst of visual delights with patches of earth and snow is fulfilled here. At the Auli Gorson winter trek we look around the smooth snow line and snow dipped peaks. From Auli trek the views of Nanda Devi peak seems as if it would be touched by bare hands. Starting and returning to delhi in this trip takes 8 days, where actual track is of 5 to 6 kilometre and required 3 hours to complete. Get set to take on the opportunities of mild acquainted with snow trekking to the Auli Gorson winter trek with best of the tour group! Day 5 : Back to Your Next Journey.